Does anybody have experienced problem with communication while connecting 32k and 16k plcs to same SCADA via factory talk linx? Does anybody have got problem with communication while RSView32 and FTView were used simultaneously with same plcs in different pcs with different shortcut names? Lakshmi requesting some clarification please? 1) Can you specify what you mean by 32K and 16K PLC? 2) What catalog number processors are you dealing with? 3) What communication protocol are you using? DH+, DH485, Serial, Ethernet? 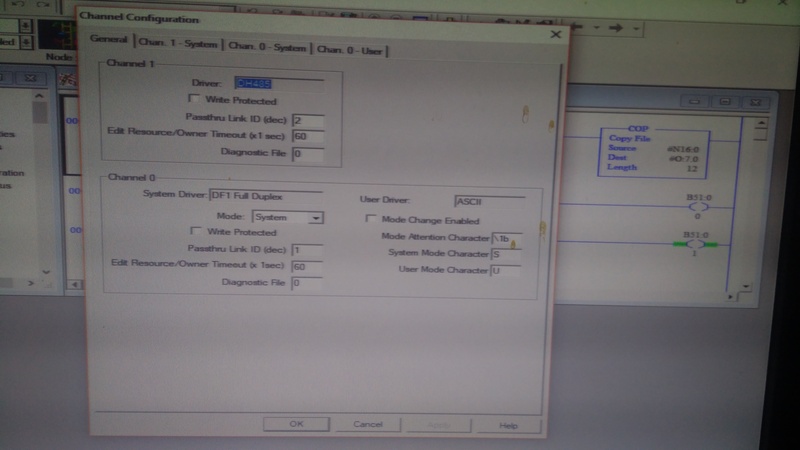 4) Describe what means using RSView32 and FTView simultaneously to same PLC. 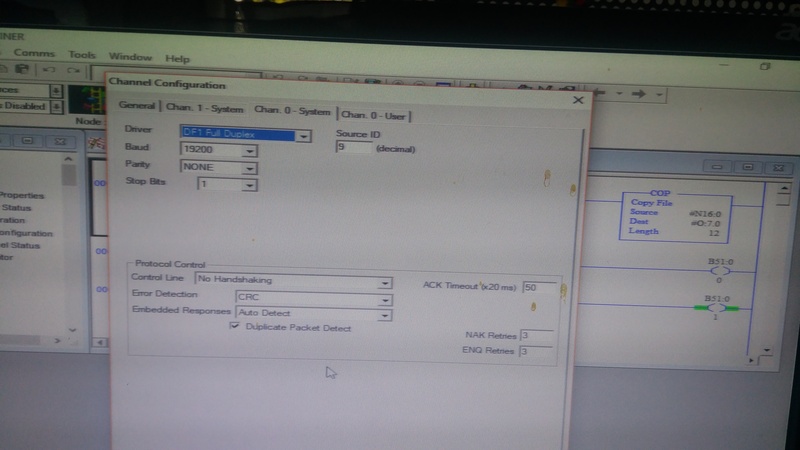 Is this PC1 running RSView32, PC2 running FTView and both looking at PLC1? Thanks for responding..so the details are like..
4) currently it is running like RSView32 in pc1 & ftview in pc2 seeing same above processors. Even when Pc1 is turned off and using only Factory talk view,I can see both plcs in Factory talk linx,but online tags and graphics are available only for L532 processor. The SLC 5/03 does not support Ethernet. The RJ45 connector is for DH485, not Ethernet. I would be curious to see what driver you're using in RSLinx to be able to see them. Are you using some sort of gatway device? If so, please share. I have some SLC500 fixed I/O processors (DH485-only) that I would love to be able to network. If you're using a DF1/Ethernet interface like the 1761-NET-ENI, it's possible that there is a configuration problem with it (like the Subnet Mask or Default Gateway) or that you have exceeded its capacity to accept incoming connections. In general, both FactoryTalk Linx/RSLinx Enterprise (for FactoryTalk View) and the RSLinx Classic drivers (for RSView32) can simultaneously connect to any controller; the memory size of the controller is not a factor. But the connection capacity or configuration of the network interface device might be an issue. Yes,I am using a 1761 NET ENI series D module with each processor . So how should I configure the NetEni module so as to get a proper communication? The Net-ENI can handle up to six incoming TCP connections. It's possible that if you are connecting to it with too many computers, you have overloaded it. I don't think the Web interface allows you to see the number of TCP connections; I don't have a Net-ENI Series D to test on. I do know that you can connect via Telnet to the device and send some commands to get some status data. Here's a Rockwell Knowlegebase article about how to do that (TechConnect required): KB 27418. One common issue is that an RSLinx Classic station with an RSWho browse open will create and maintain a connection to a Net-ENI, so it's possible that in a large enterprise network that you have computers that are just running RSLinx in a background window that are taking up resources on the Net-ENI. I tried with 1 PC and 1 L533E Plc via 1761Net Eni,Opened Rslinx Enterprise, Added Ethernet driver manually,configured L533E plc IP. I was able to see my plc. But when i browsed for online tag addresses, nothing was there. Also when i made a screen test, nothing was updating in screen. When i tried the same with L532E processor, everything was fine. So now the net eni is connected to 1Pc & 1 PLC ,still the issue persist. There is no difference between the 16K and 32K controllers in their ability to communicate via the serial port. So your problem could be in the configuration of the serial port, or with physical damage to the serial port, or with differences in the data table addresses that you are attempting to read and write. But it's not a firmware problem. Thankyou sir for your response. I checked with serial port configuration of both plcs and found as same. By difference in data table address,did you mean like Iam having an address in SCADA which is either beyond data table elements or not used in data table? Iam sending pics of current situation. like Iam having an address in SCADA which is either beyond data table elements or not used in data table? Yes, that is definitely possible. FactoryTalk View's diagnostic log will generally indicate the data table addresses it cannot read or write. I tried with a dummy program,with just one rung,2 B3 bits being used.downloaded to both L432E & L533E,took a fresh SCADA. Configured Rslinx Enterprise with both processors and different shortcut names. when i searched for online tags in tag data base,data table address of L532E was there,and nothing from L533E. I tried the same with one processor at a time. what i can see was Rslinx Enterprise was not able serve for L533E.Nothing comes from or goes to Rslinx Enterprise. Either something is prohibitting Rslinx Enterprise to communicate with L533E or it's not compatible. I want to add one more thing. As i said before,this is a migration project from Rsview32 to Factory talk view. Both of these types plcs L532E & L533E worked well with RSView32. Maybe nothing, but in Enterprise, did you build two different shortcuts (different names) and point them to the actual correct devices in Enterprise? The only other thing I can suggest is using RSLinx Classic, since it can see and talk to both SLCs via the UICs. Reminder, RSView32 talked via RSLinx Classic. A couple of years ago, I migrated an old RSView32 application to FactoryTalk SE with dual servers. I remember having to run RSLinx Classic in the background and (sorry, I can't remember exactly how I did it, but will try to find out) tying it to the SE application or project. This could be nothing, but I have had occasions, especially using a UIC device. If RSLinxs classic is running, and RSLinxs Classic UIC Driver is running and you can see your PLC's in the RS Who window, Then I was never able to connect to them with RSLinx enterprise in Factory Talk. I would have to stop the driver, and delete it for good measure(in RSLinx Classic), and then shutdown RSLinx Classic before Factory Talk would see the processor or tags. Basically, if RSlinx Classic has control over a comport, it will not let any other program access it while it is running.